Don’t Want To Settle For Just Any Illinois Court Reporter? Discovery has the right Illinois court reporter for your deposition. Located on Merchandise Street in Chicago is a team of Discovery Litigation Services experts ready to provide you with the most qualified Illinois court reporters and comprehensive legal solutions. 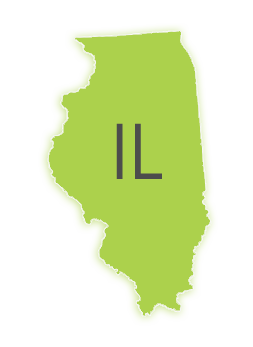 With our real time ready, live streaming enabled Illinois court reporters, we can provide you quality, reliability, and accuracy, anywhere in the state. Our stenographers are highly experienced in a wide array of case sizes pertaining to various industries. Discovery Litigation Services is founded by a seasoned court reporter who understands the importance of the court reporter’s role to go above and beyond in meeting your demands. With An Experienced Court Reporting And Legal Services Firm, You Get More. Connections, expertise, a staff of experienced professionals, technological knowhow. With a one-off freelance court reporter, you are still on the hook for filling every other role and coordinating putting all of the pieces together for the deposition. Enlisting the services of Discovery gets you more than a one-off service. You get a comprehensive solution. Just by uploading your deposition notice you’re putting the full force of Discovery Litigation Services’ team behind you. From coordinating schedules, providing court reporters, interpreters, and even building out your repository and pulling all deposition materials together in a trial ready format to live streaming the deposition to remote parties. Discovery offers the complete package. With Discovery, you get a professionalism, expertise, and security in redundancy. Losing individuals due to scheduling conflicts and illness can threaten the success of your case. It provides unnecessary obstacles and is absolutely avoidable. Discovery Litigation Services’ extensive network provides you security in knowing you’ll have that court reporter, that document review attorney, and that videographer you need when you need them. It shouldn’t be difficult to get hardworking, experienced professionals who are nice. Often times it is! Just remember back to the last time you went to a mechanic. You shouldn’t have to steel yourself against those you are paying to provide you with a service. Discovery Litigation Services was founded on the premise that you deserve more. We are grateful for the opportunity to work alongside you and to serve you to the best of our abilities. We believe that you deserve access to high quality professionals at a price that won’t break the bank. You deserve to work with top level court reporters, videographers, document review attorneys and with legal professionals who are helpful and nice. Discovery Litigation Services was founded by a seasoned court reporter who is motivated to provide you with over twenty years of expertise and support in a helpful and pleasant manner. Alexander Gallo has worked tirelessly to build a team of professionals who are devoted to upholding that culture and in an effort to give you the best. Discovery Litigation Services offers solutions for Court Reporting in Every Part Across Chicago. - Videography - Dispute Resolution - Mediation - Arbitration - Interpretation - And More. Schedule Your Deposition in Any State Throughout The U.S.